SATURDAY APRIL 20. Yeah that’s right 420 TROPICAL PARTY @ Brillobox. Gonna be a killer party. here is more info on upcoming stuffs…. We are pleased to announce the first in a series of 3rd Saturday Events @ BRILLOBOX. Here is the event page on Facebook Over the next few months, and who knows, maybe from now on PANDEMIC PRESENTS… will be on 1st Fridays and 3rd Saturdays. We are going to use the 3rd Saturdays as an opportunity to have more Guest DJ’s, MC’s, Live Bands, and even some Bellydance Hafla’s. Should be a great new addition. But not to worry we still have our regular FIRST FRIDAYS @ BRILLOBOX as part of the UNBLURRED. 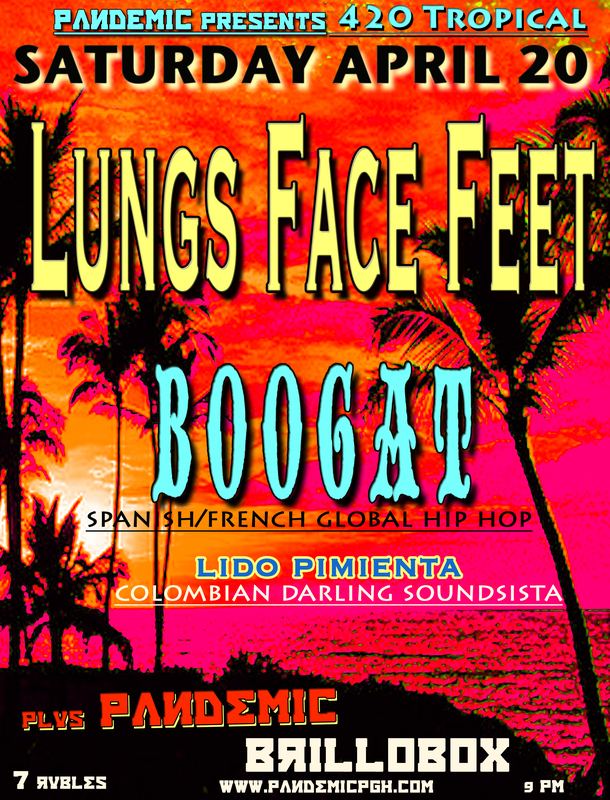 Here is a pretty awesome track by this months special guest BOOGAT called Eres Hecha Para Mi. more info to come on upcoming events.